Trainer Brett Bellamy respects the opposition but is confident his talented mare Super Tonic ($3.40 favourite with TAB fixed odds) can maintain her perfect home-track record when she resumes at Coffs Harbour on Tuesday. Super Tonic is unbeaten in five starts on her home track at Coffs Harbour - including two impressive wins there prior to a spell - and looks the one to beat again in Tuesday's Coffs Hotel Spring Flyer (1000m). "It's a good, solid field of sprinters and you'd have to respect just about every runner in the race, but my mare loves the track, has a good jockey (Josh Adams), has drawn a good barrier and the likelihood of a soft track certainly won't hurt her chances either," said Bellamy. The Coffs Harbour track is currently rated a Soft 5. Super Tonic loves rain-affected tracks with all of her five wins at Coffs Harbour coming on soft (four wins) or heavy ground (one win). Super Tonic, a five-year-old by Supreme Class, has had just 10 starts, winning her five Coffs Harbour starts but finishing unplaced in the other five runs. 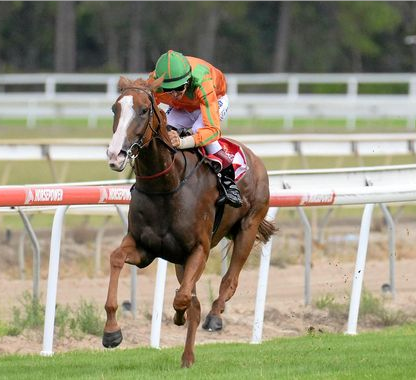 She was in great form prior to her spell, winning the NRRA Championship Preview (1305m) at Coffs Harbour on February 25, finishing just behind the placegetters off a wide barrier in a Benchmark 70 Hcp (1300m) at a Gold Coast metro meeting on March 17, then returning to Coffs Harbour for back-to-back wins (over 1215m and 1200m) on April 19 and April 27. Super Tonic produced her best effort to date in the April 27 win, overcoming barrier 14 to easily account for Flaming Aces and Youwaitandsee in a $30,000 Open Showcase Hcp (1200m). Bellamy has always believed the lightly-framed mare would keep on improving as she matured and says her best is yet to come. "She hasn't filled out any more physically during her spell, but that's just her," said the trainer. "We did plan to have her back racing a little earlier with the Coffs Harbour Carnival (in August) in particular in mind, but that didn't happen. "I'm very happy with how she's come back. The 1000m on Tuesday doesn't pose a problem at this stage of her prep and she's drawn to get an ideal run just off the pace. If she comes back as well as I expect this prep, I'm certainly looking to take her to town (Sydney) for a suitable race this prep and I think she will eventually run out a strong 1400m." Super Tonic's main rivals on Tuesday include Gold Coast galloper Impregnable ($4.20), Grafton sprinter Knight Templar ($7.50), and the Coffs Harbour-trained pair Gunnaza ($10) and Florelle ($5). The Toby Edmonds-trained Impregnable, resuming since June, usually races very well first-up and has won three of his four starts over 1000m. The Jason Reilly-trained Knight Templar, first-up since being outclassed in the Ramornie Handicap in July, has been very consistent over the past 12 months and geared up for his return with an easy Grafton barrier trial win over 1000m on September 25. The Mick O'Neill-trained Gunnaza rarely runs a bad race on his home track at Coffs Harbour, especially over the 1000m trip where he has won five of his nine starts over the distance.